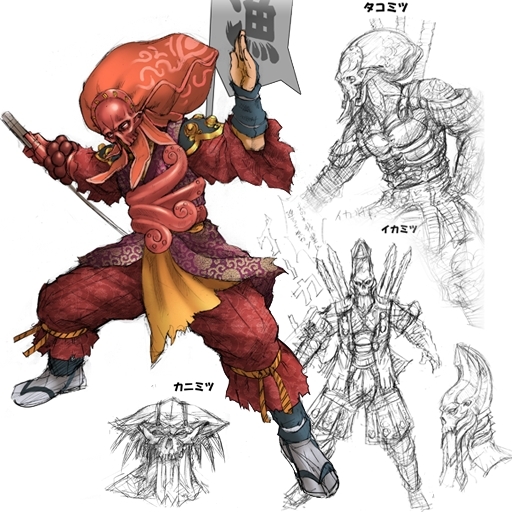 As the leader of the Manji Party, Yoshimitsu dedicated himself to providing food, medical assistance, and shelter to the ever-increasing number of political refugees around the world. 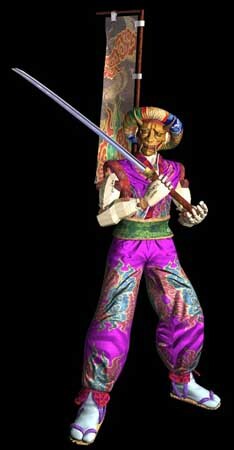 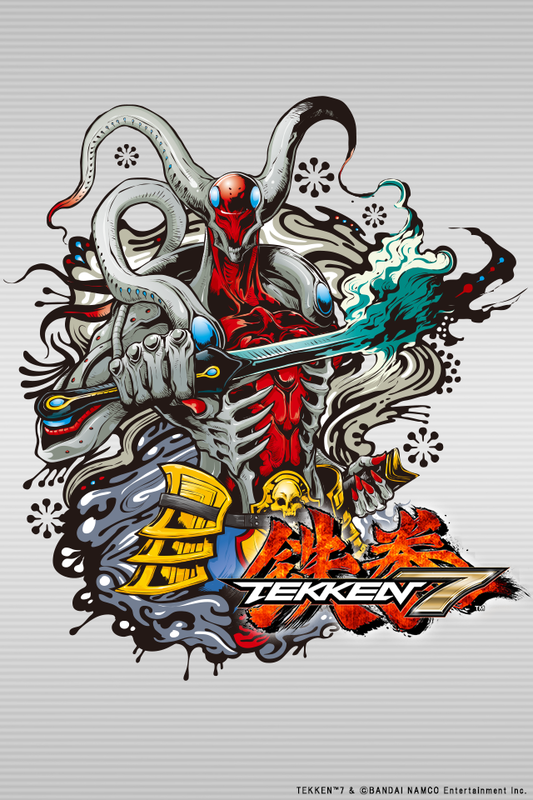 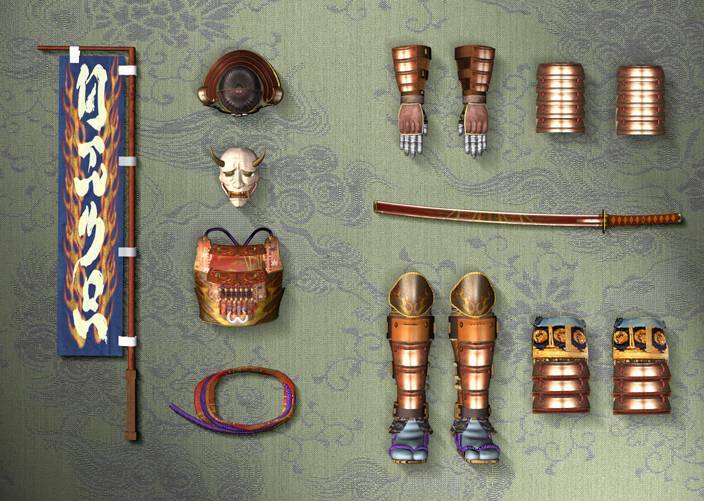 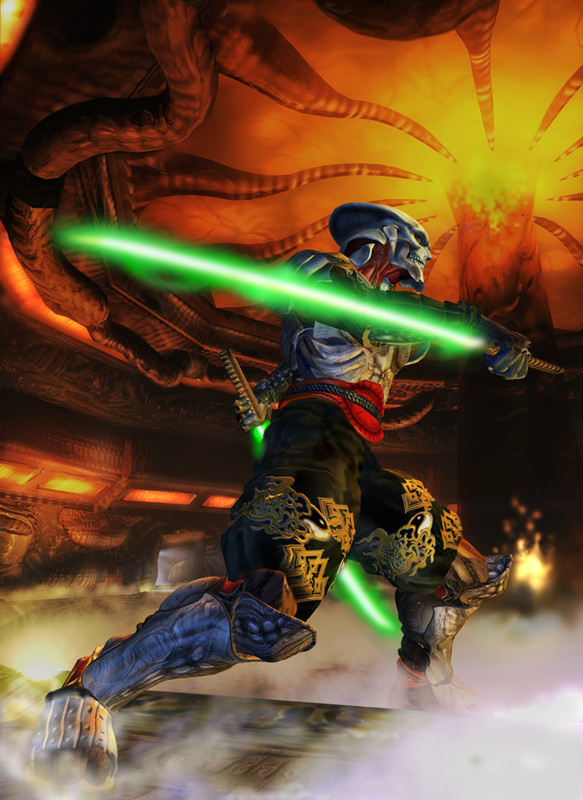 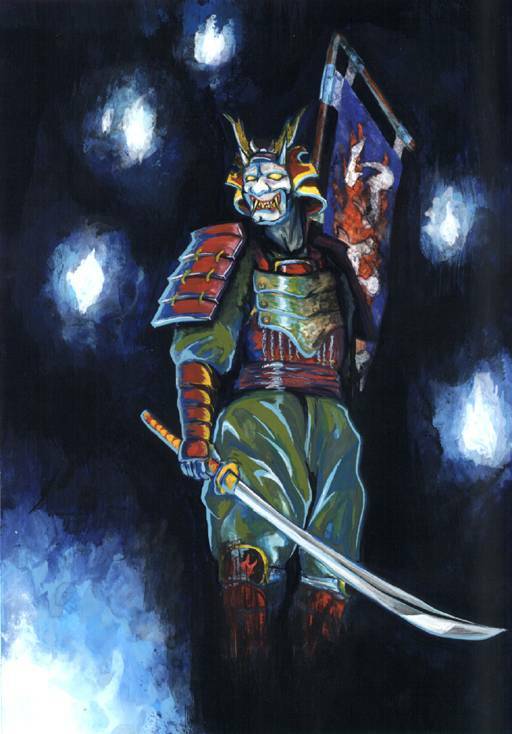 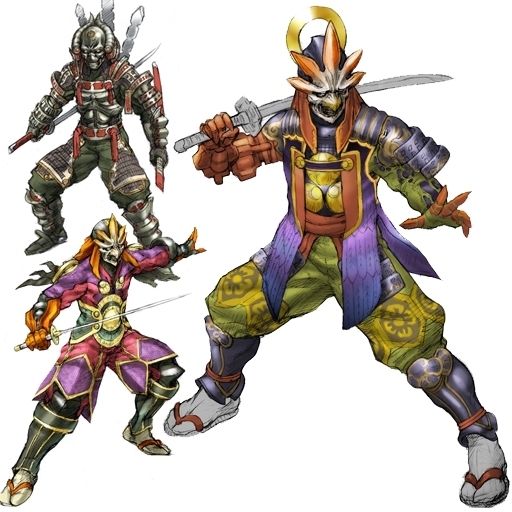 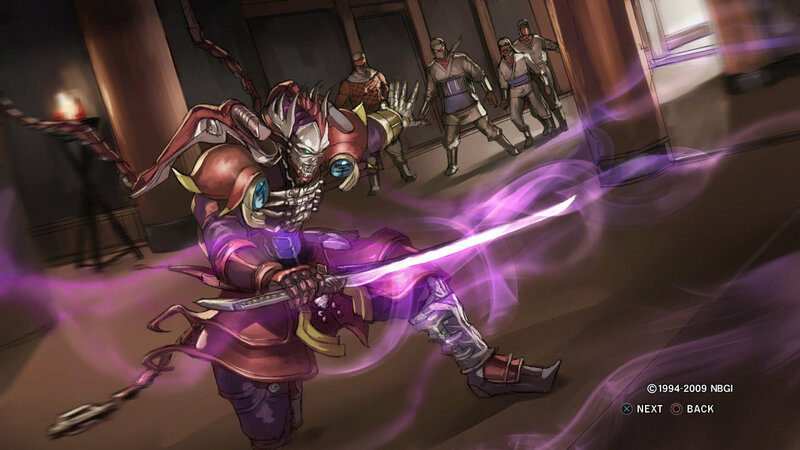 Using advanced Manji Ninjutsu Arts as his fighting style, Yoshimitsu entered the first King of Iron Fist Tournament as a distraction, to allow the Manji to steal the tournament's funds unobserved. 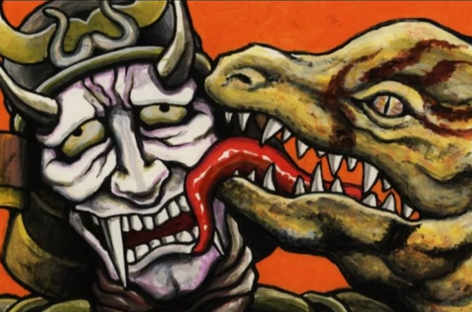 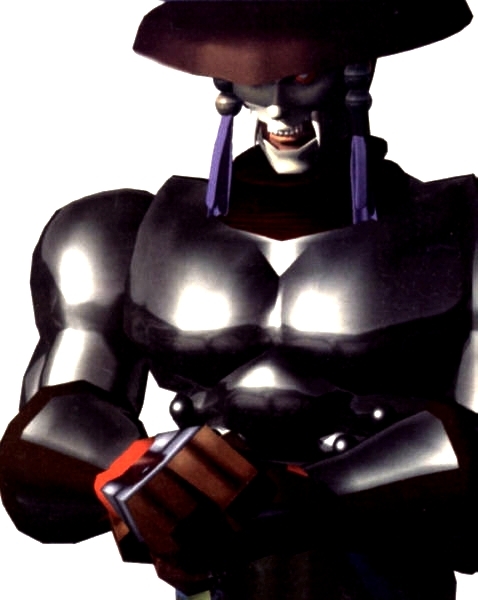 During the time of Tekken 2, Yoshimitsu learned that the scientist named Dr. Boskonovitch, who once saved his life, had been abducted by Kazuya Mishima. 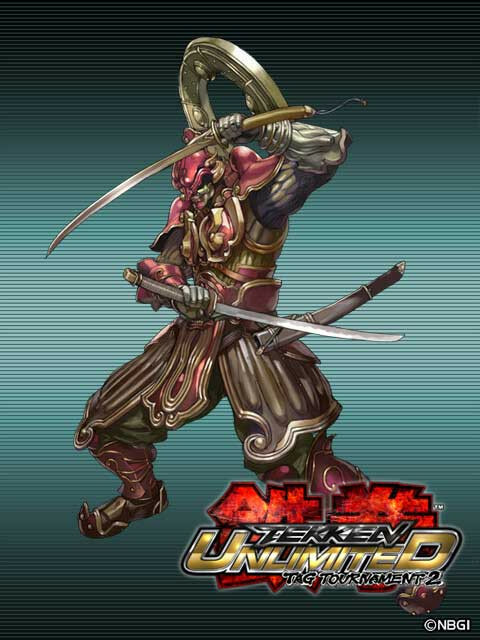 To rescue Boskonovitch, he entered the King of Iron Fist Tournament 2, and was able to save his friend. 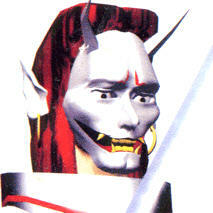 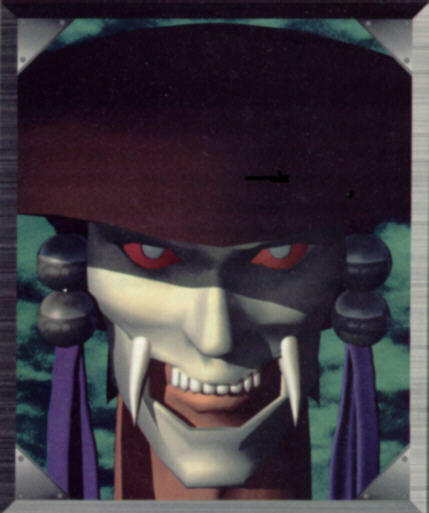 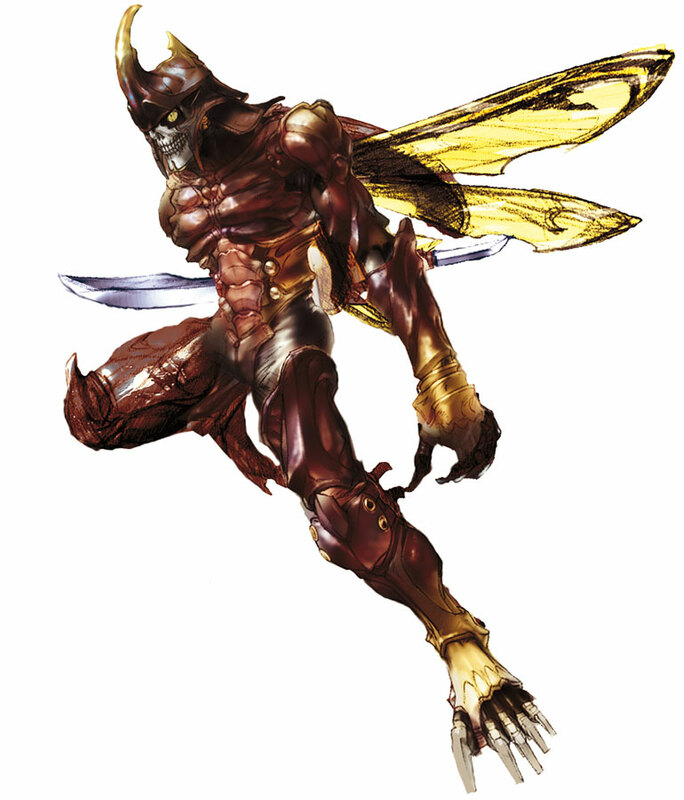 Later in Tekken 3, Yoshimitsu entered the tournament upon learning that his friend, Dr. Boskonovitch, needs Ogre's blood to live. 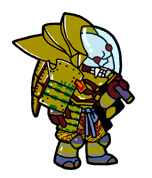 Unfortunately, with a constant lack of necessary funding and manpower, Yoshimitsu was unsure about the future of his organization. 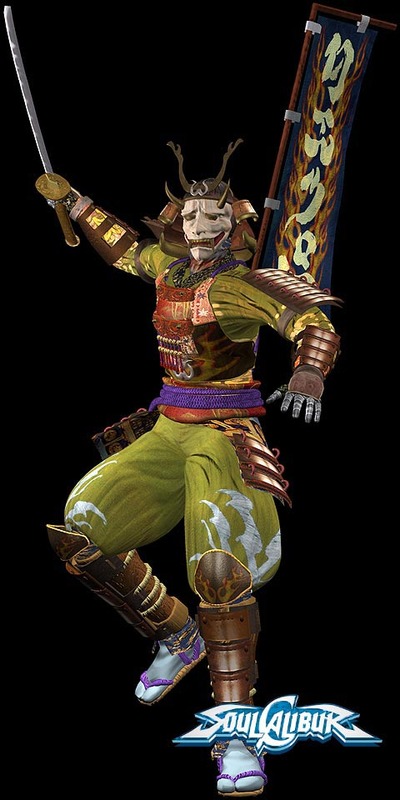 When Yoshimitsu heard about The King of Iron Fist Tournament 4, he envisioned a union between the Manji Party and the Mishima Zaibatsu. 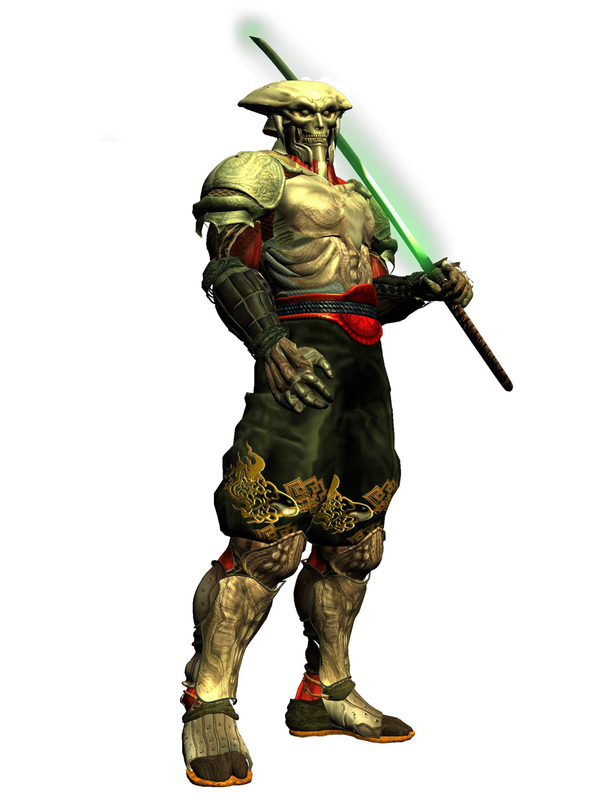 With this dream in mind, Yoshimitsu decides to enter the Tournament immediately. 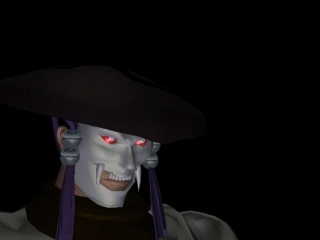 He must defeat Heihachi Mishima at any cost. 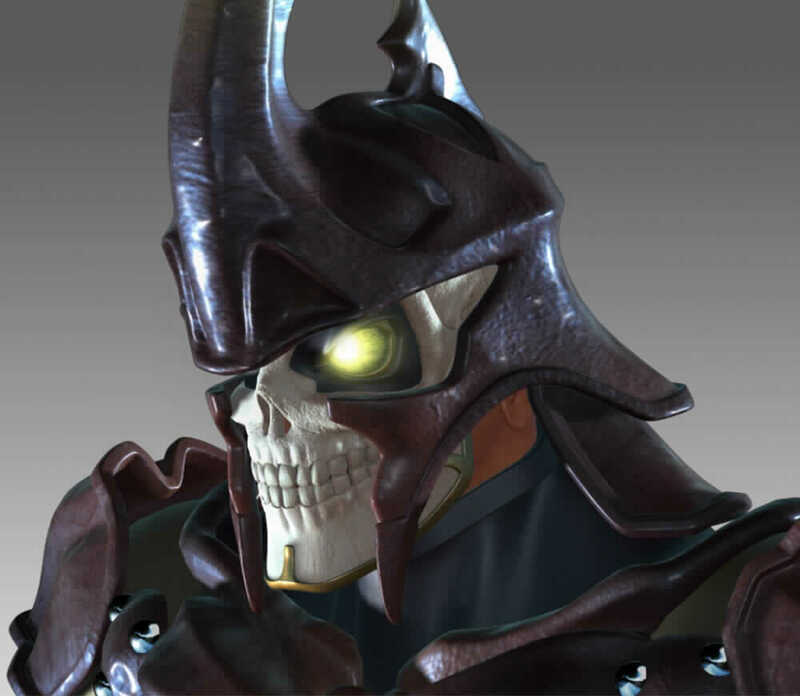 At the end of the King of Iron Fist Tournament 4, Yoshimitsu broke into the Mishima Zaibatsu vaults and stole the money for his own. 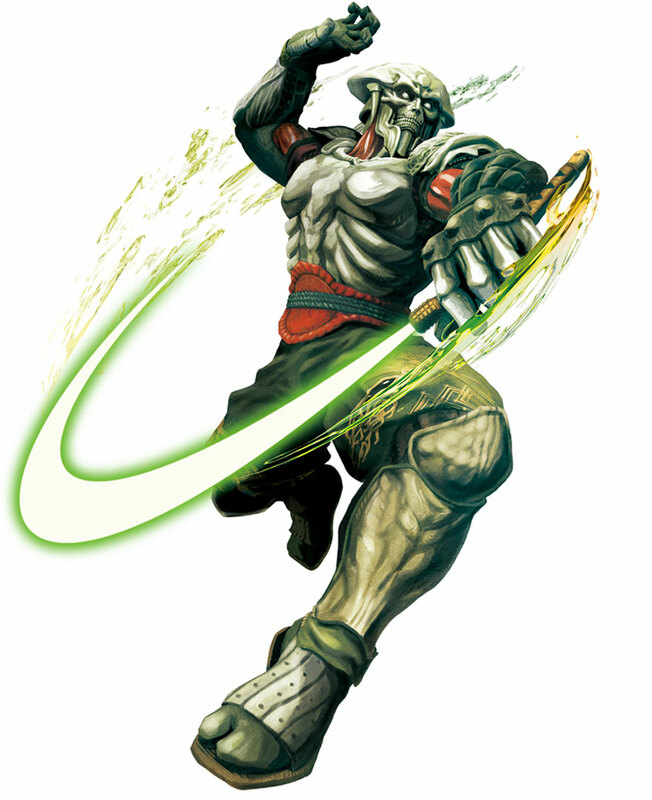 During this operation, Yoshimitsu notices the fallen Bryan Fury and takes him to Dr. Boskonovitch. 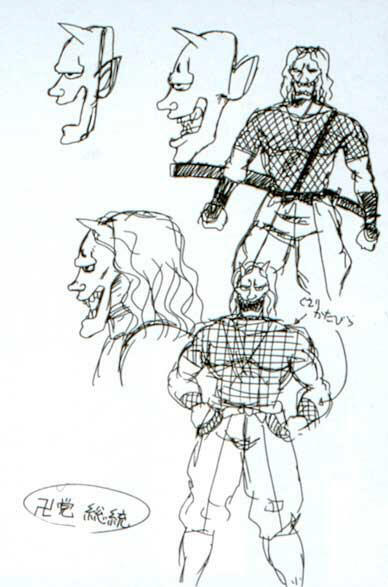 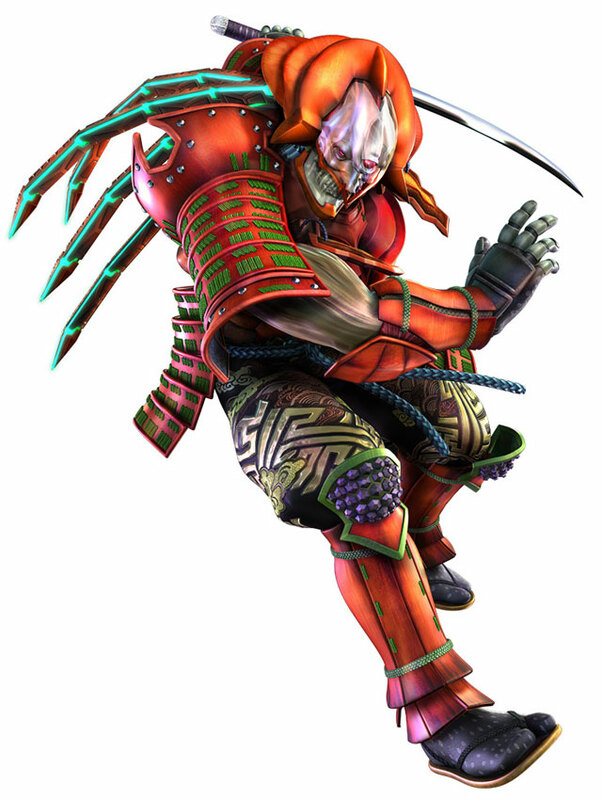 Before the events of Tekken 5, Yoshimitsu mangages to break into the Mishima Zaibatsu's vault, where he finds an injured Bryan Fury and helps him escape. 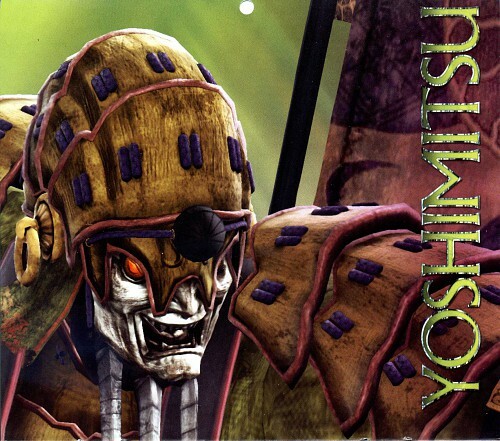 One month later, when Yoshimitsu visits Dr. Boskonovitch's lab, he finds his comrades dead. 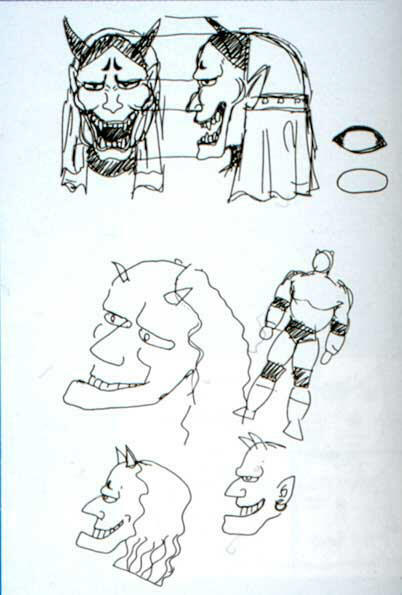 This was Bryan's thanks. 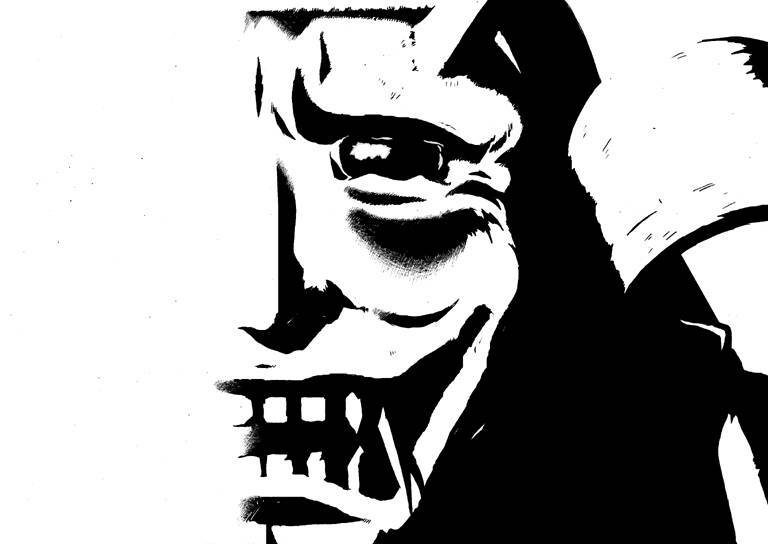 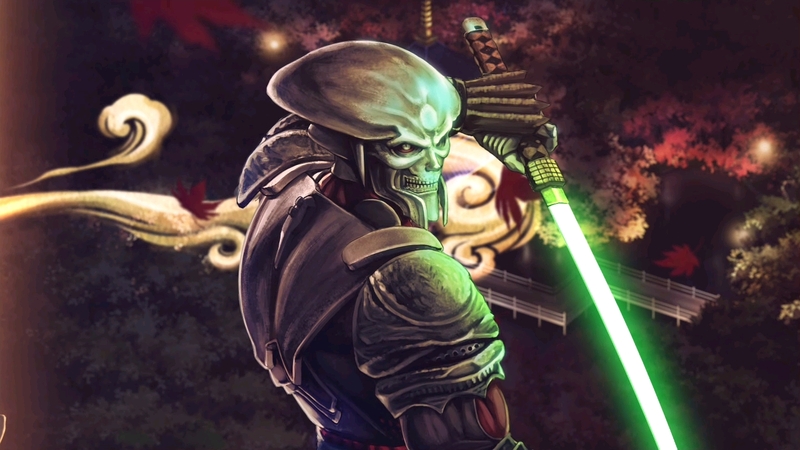 "He shall pay for what he has done," says Yoshimitsu. 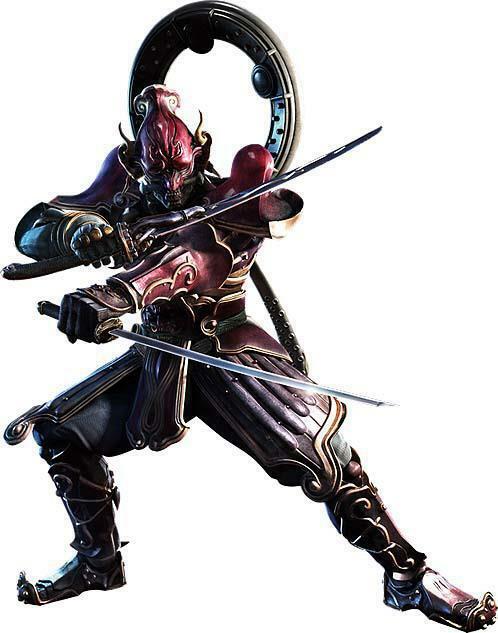 Learning Bryan will fight in The King Of Iron Fist Tournament 5, Yoshimitsu sharpens his sword and enters the fray. 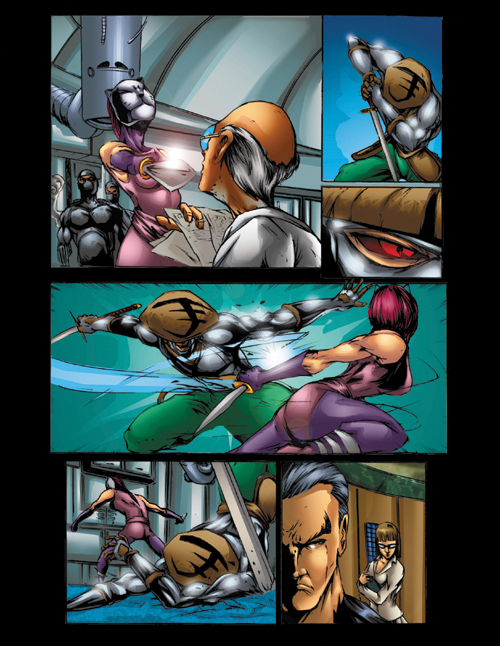 Trying to avenge his fallen Manji clan comrades, while going after Bryan, Yoshimitsu realizes that his sword is weakening. 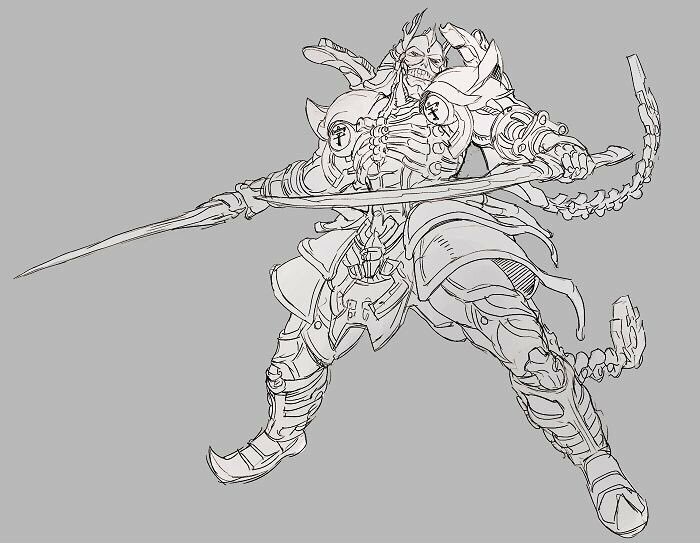 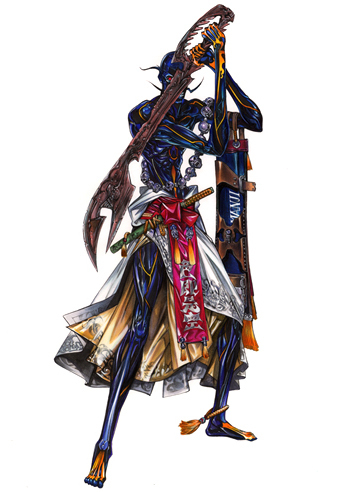 His sword is a cursed blade. 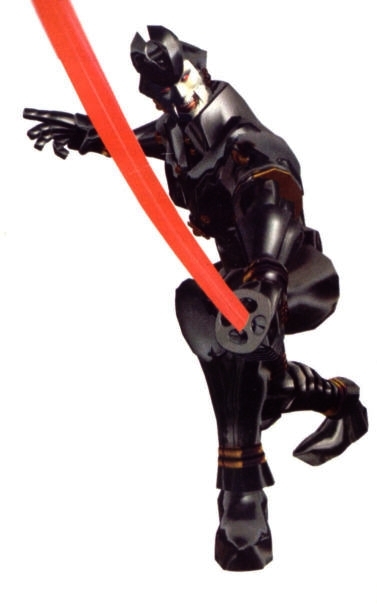 By killing evil doers and villains the sword would retain its power, otherwise the cursed sword will make the user go insane. 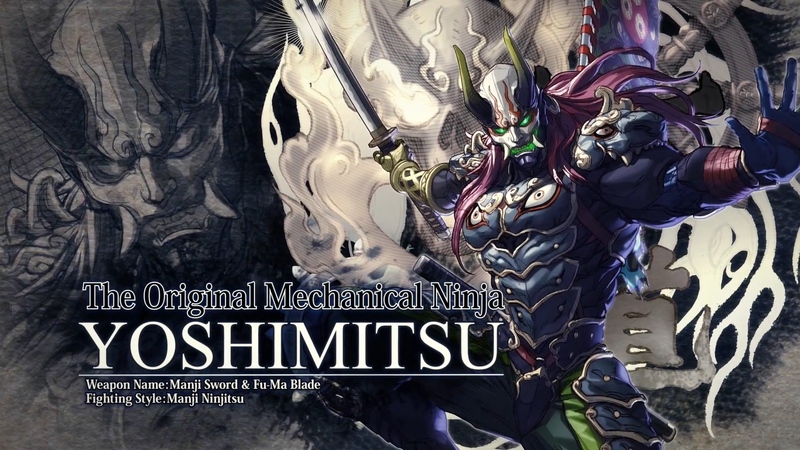 Yoshimitsu realizes that he can no longer use his old sword and decides to use another blade that seals the properties of the cursed sword. 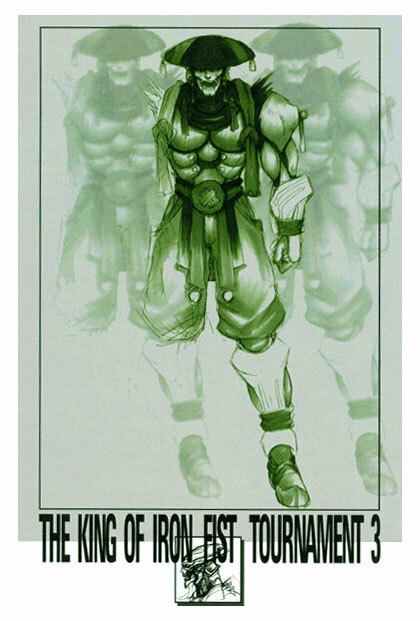 He then decides to enter the King of Iron Fist Tournament 6. 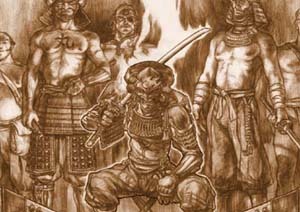 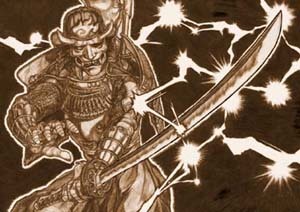 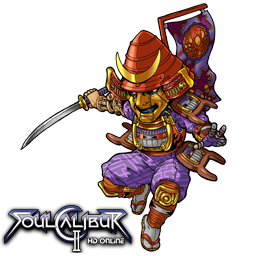 In the Soul Calibur saga, Oda Nobunaga, the daimyo of Owari, sought the power of the Manji clan and invited its chief to Azuichi castle. 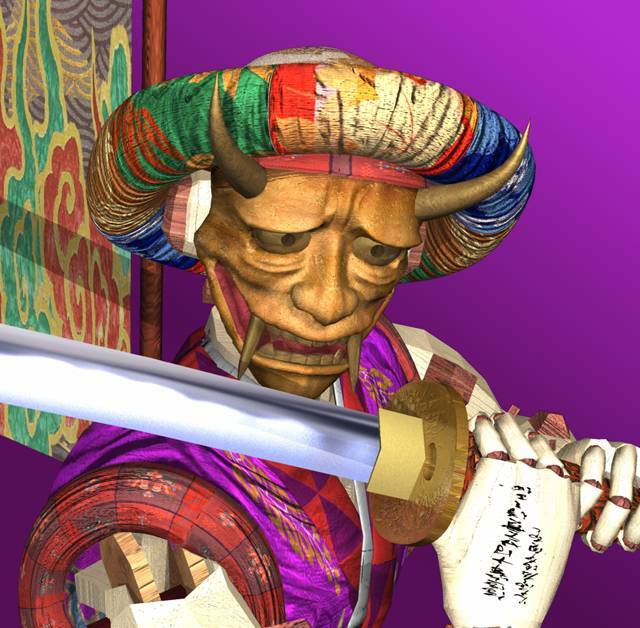 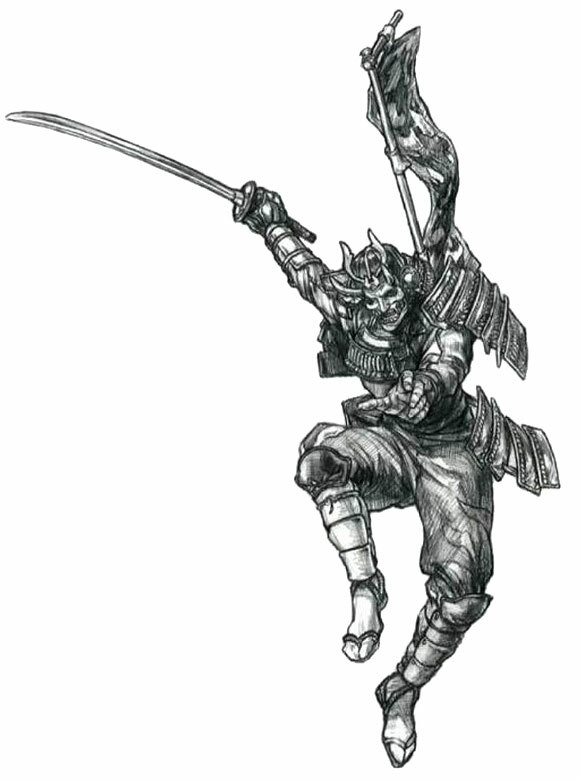 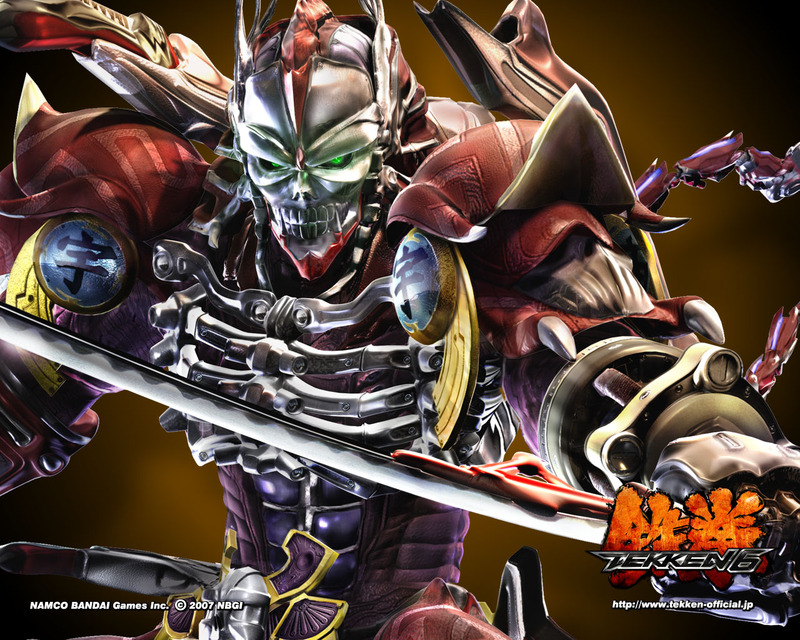 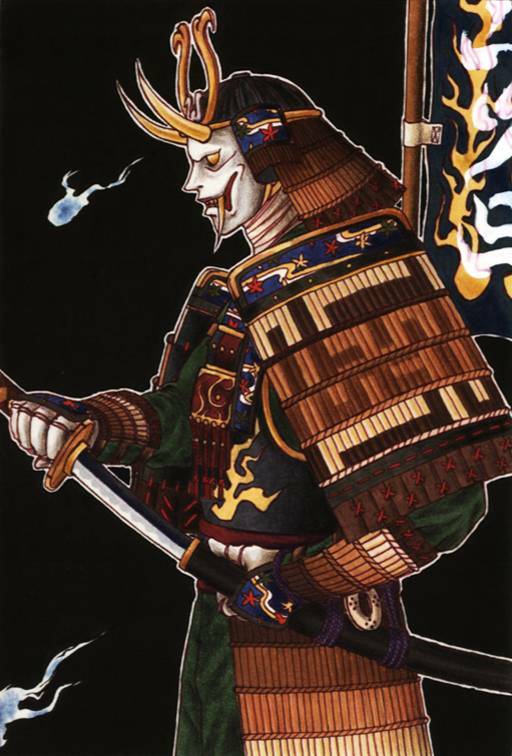 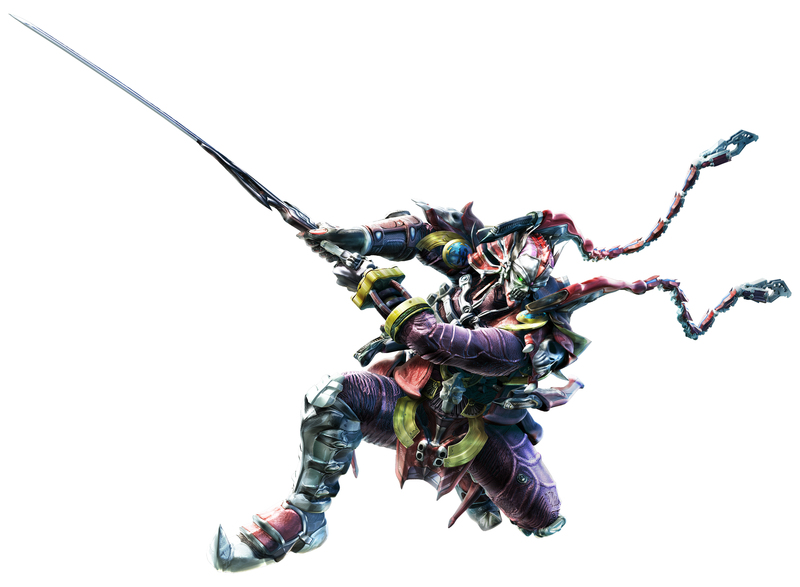 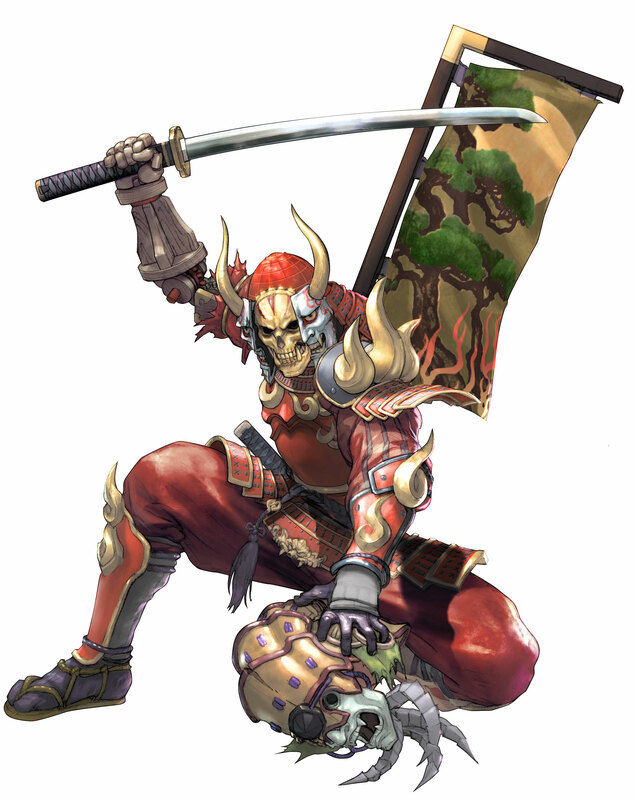 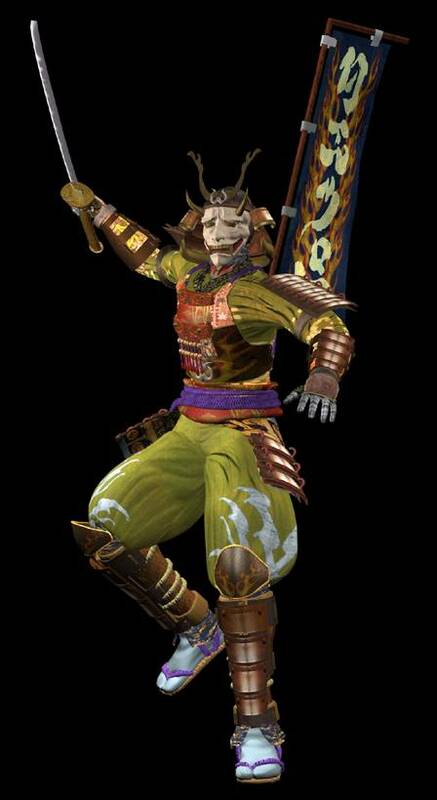 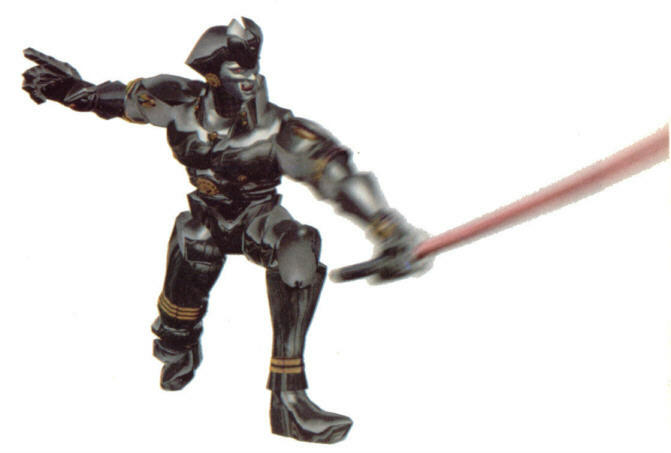 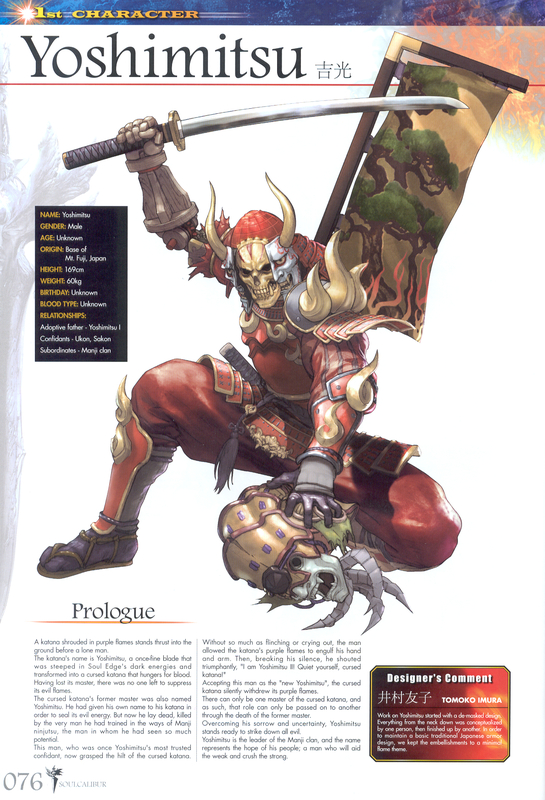 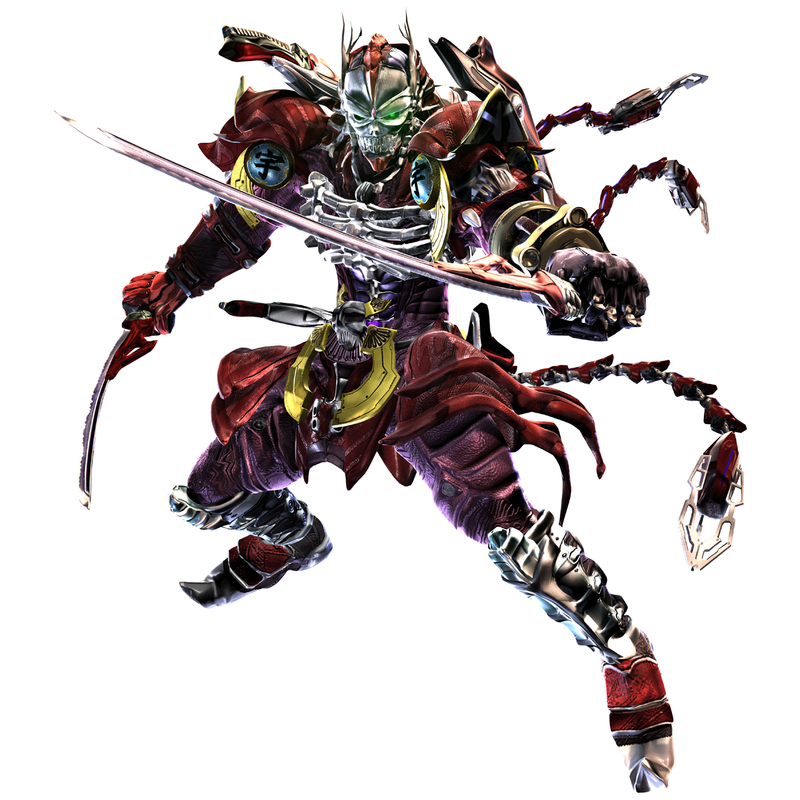 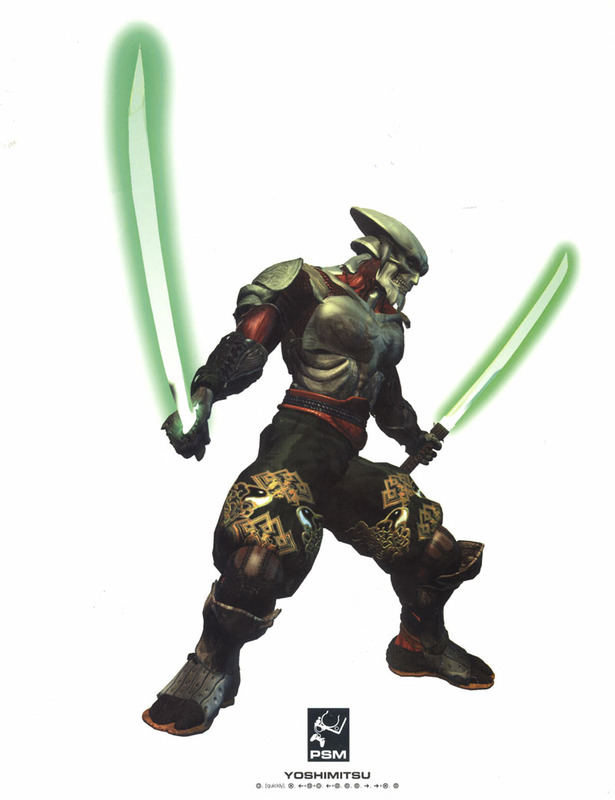 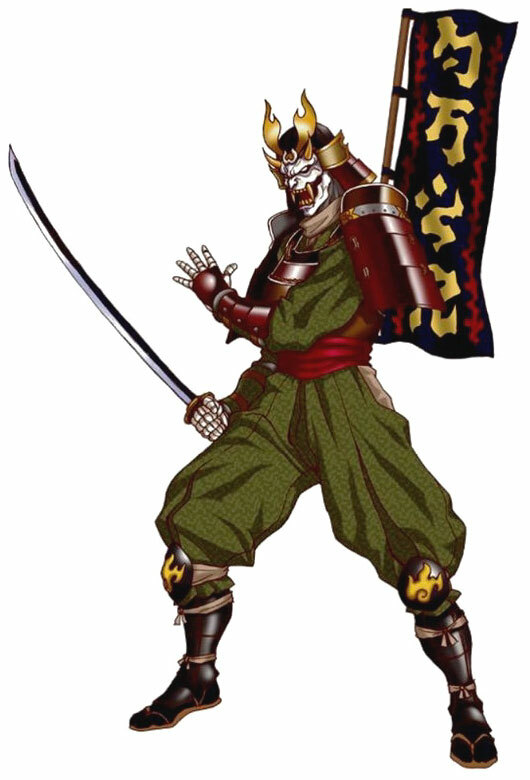 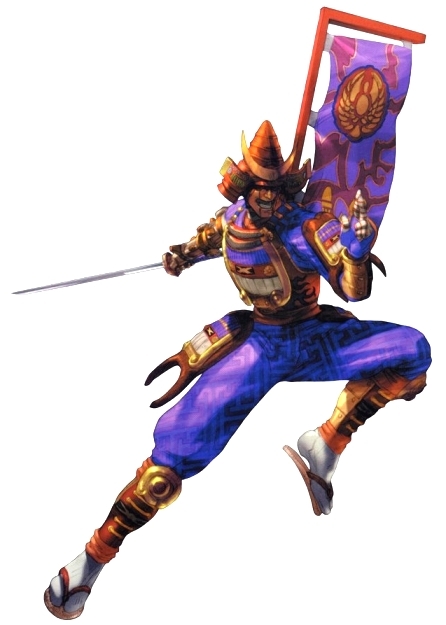 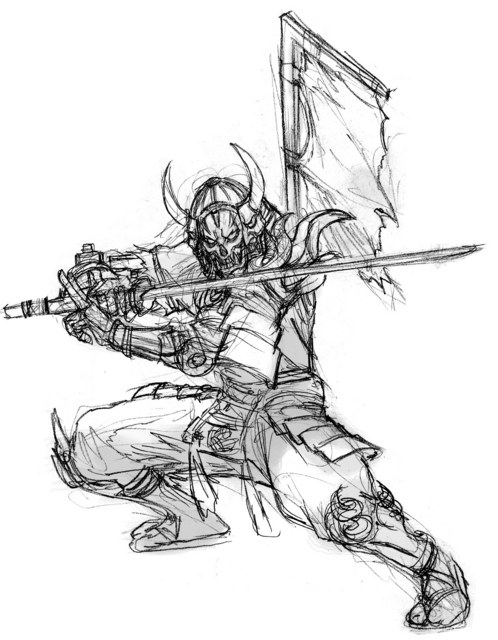 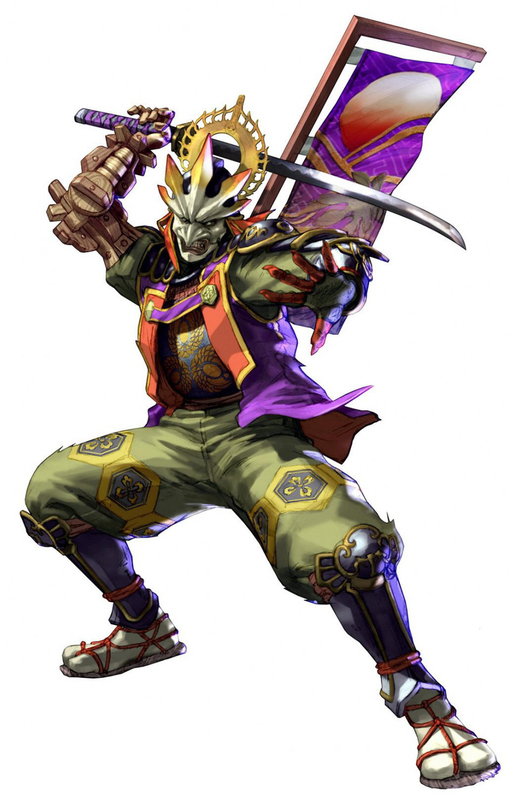 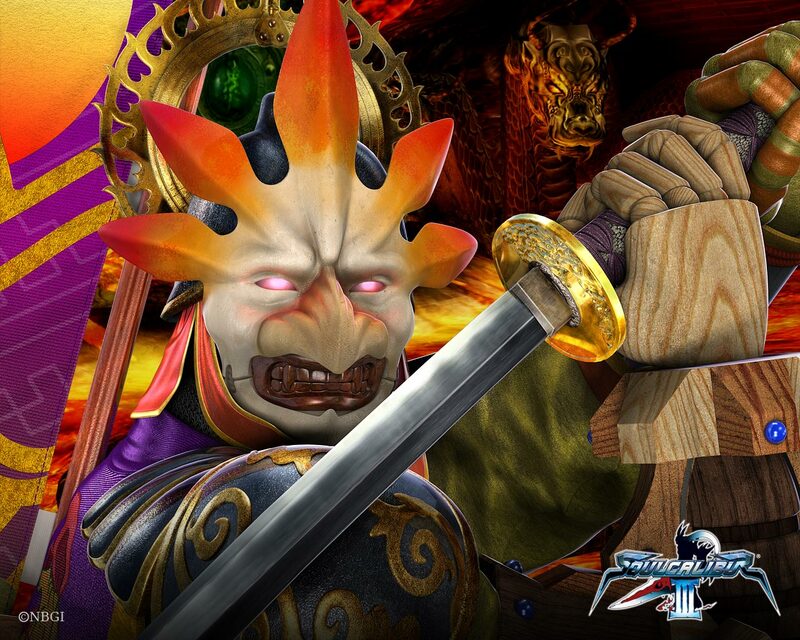 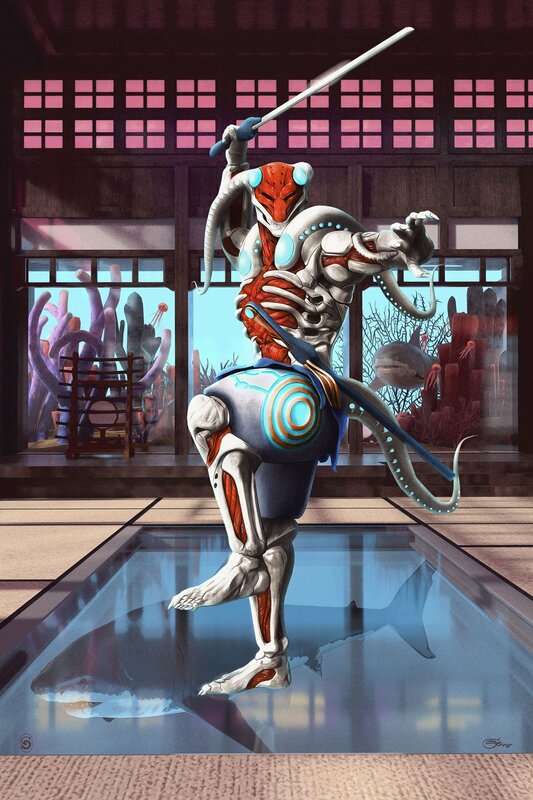 Due to his advanced age, the clan's chief sent the strongest warrior, Yoshimitsu, of the clan on his behalf. 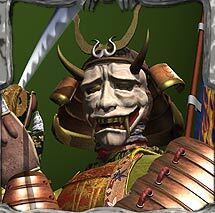 As expected, Nobunaga requested the allegiance of the Manji clan, but the Manji clan preferred to remain hidden. 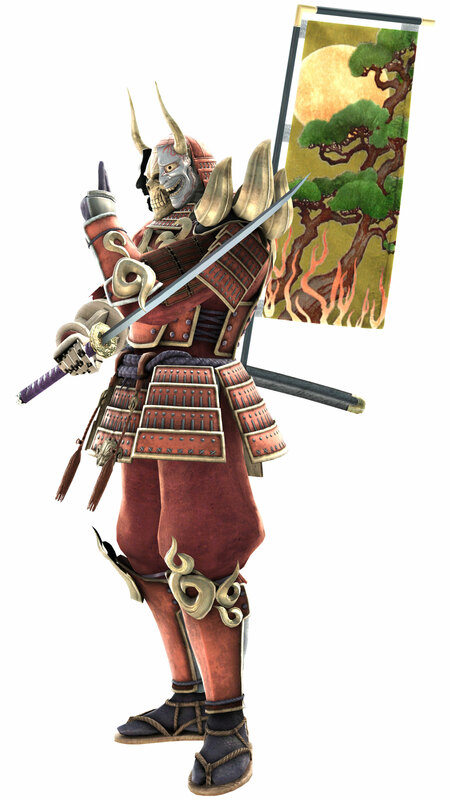 After a few days' stay at the castle, the fighter politely denied Nobunaga's request and returned to his village. 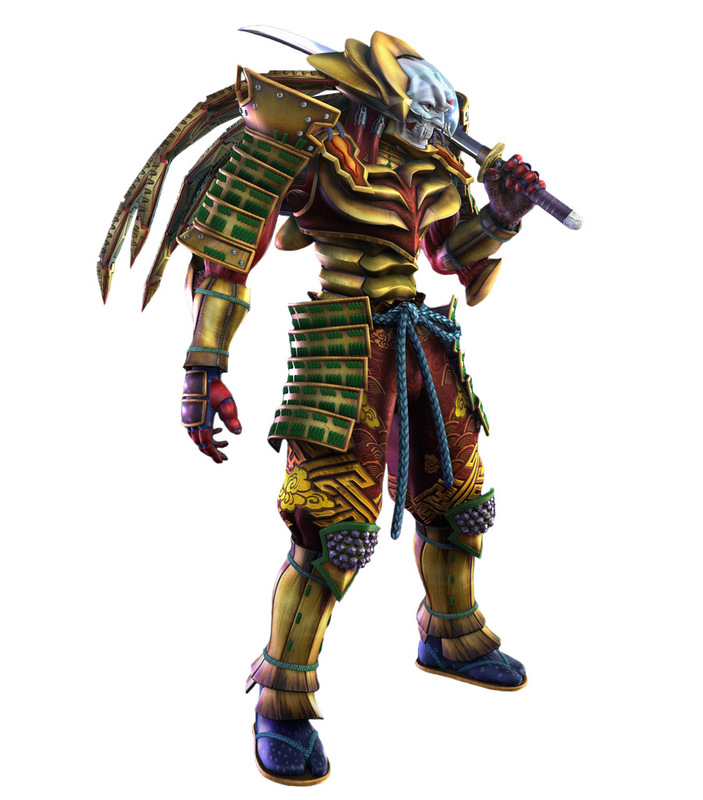 I'm pretty certain Yoshimitsu has the most costumes out of any fighting game character in history... Athena comes close, but Yoshimitsu... wins. 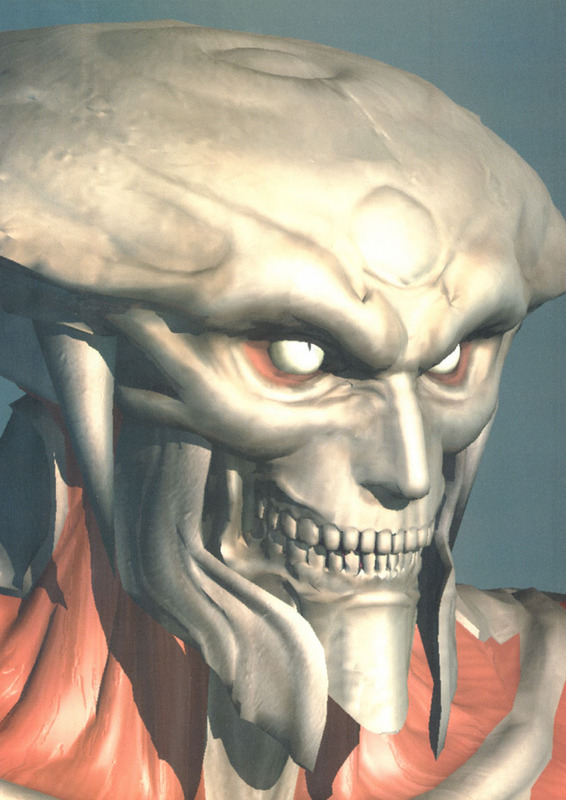 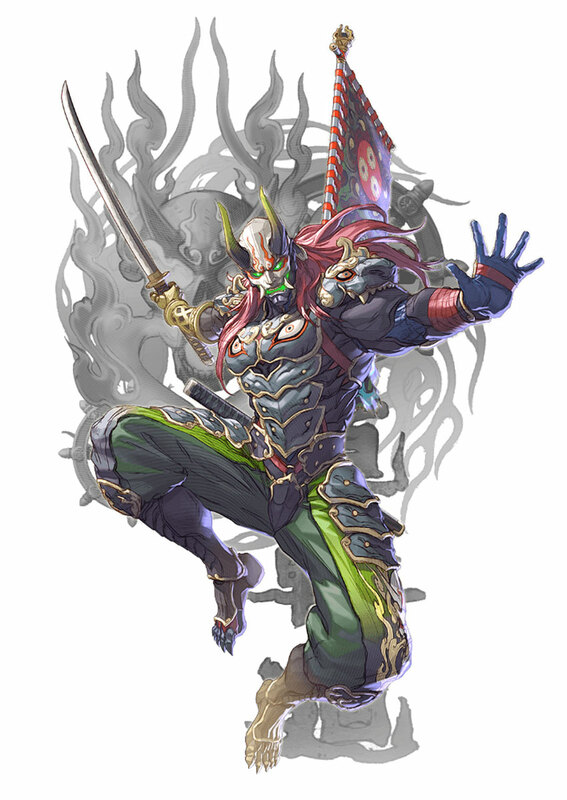 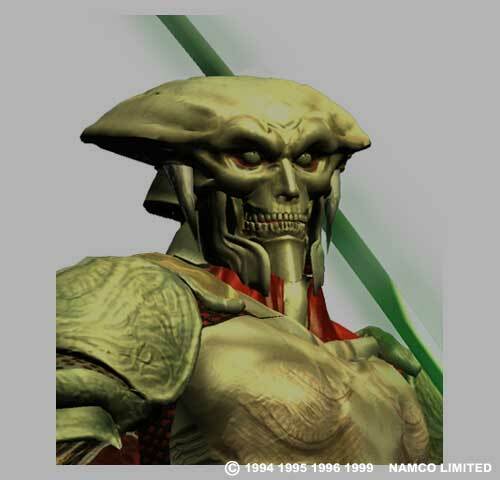 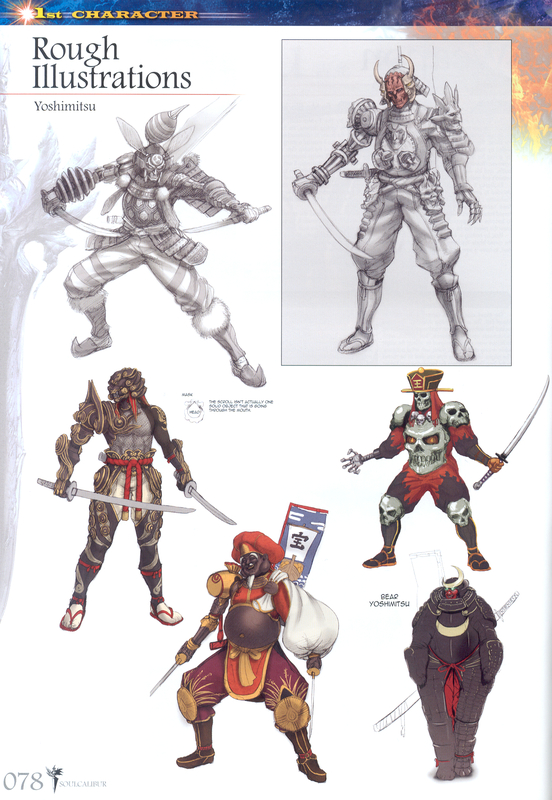 The fact that his design has gone through so many evolutions has enabled Yoshimitsu to be intriguing and a fresh design in every single game he's appeared in. 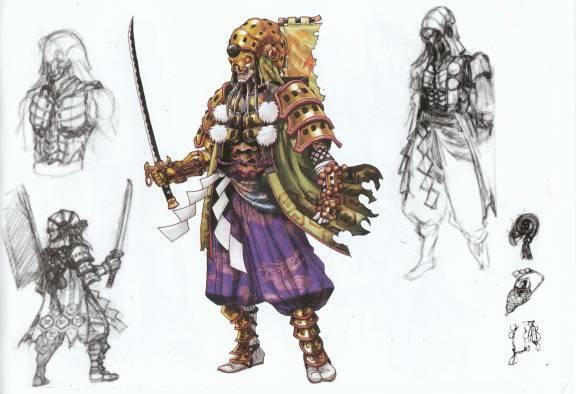 He's got a few traditional samurai get-ups, several cyborg ninja looks, a bug-ish incarnation, a couple squid-inspired outfits, and a few that just can't be put into words. 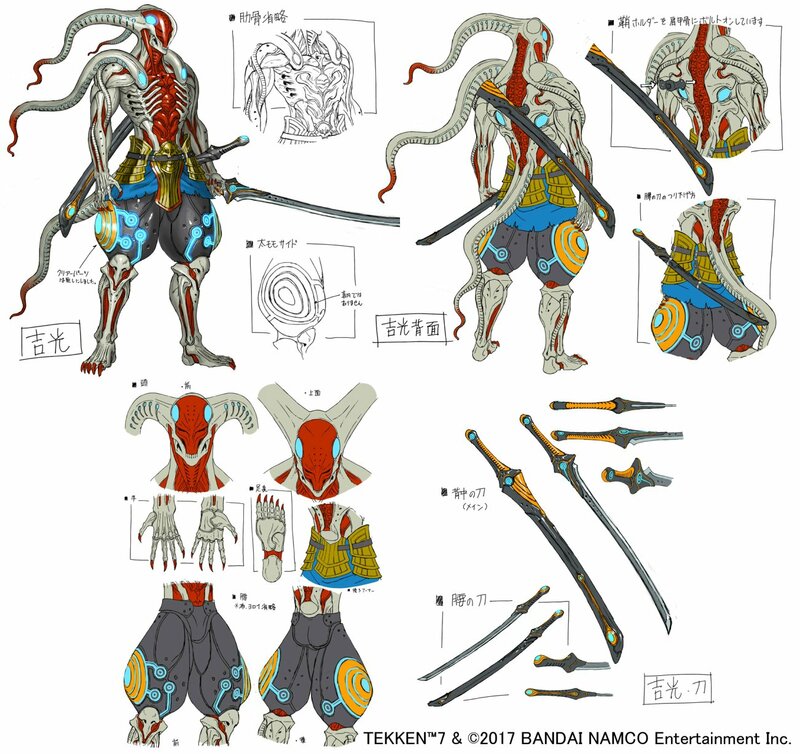 All of which are amazing designs by Bandai Namco... it's impossible to pick a favorite. 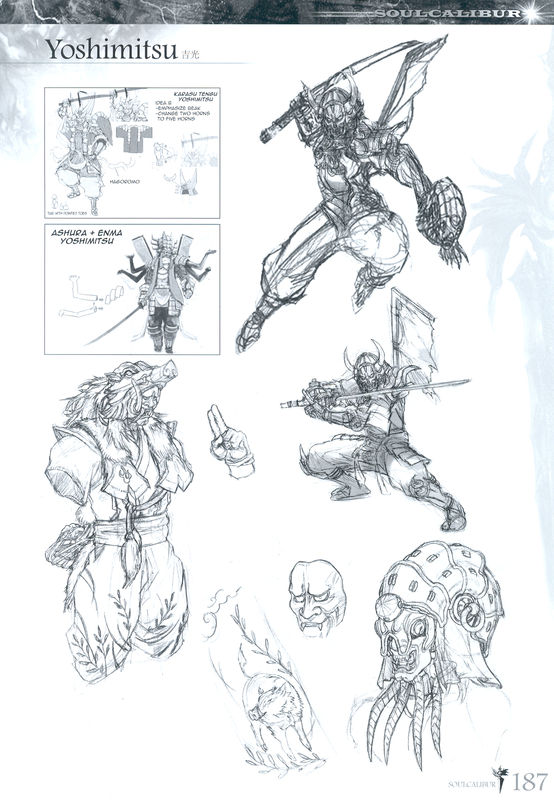 Aside from Yoshi's good looks, he has acquired so many innovative & hilariously entertaining moves over the years. 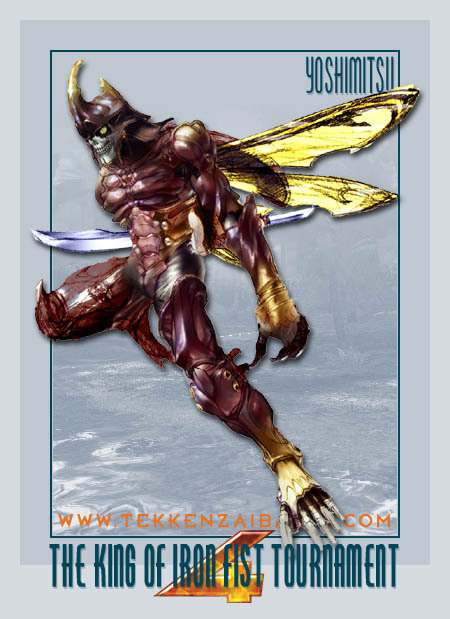 It's been fun watching his moveset evolve throughout all the sequels of TEKKEN and Soul Calibur. 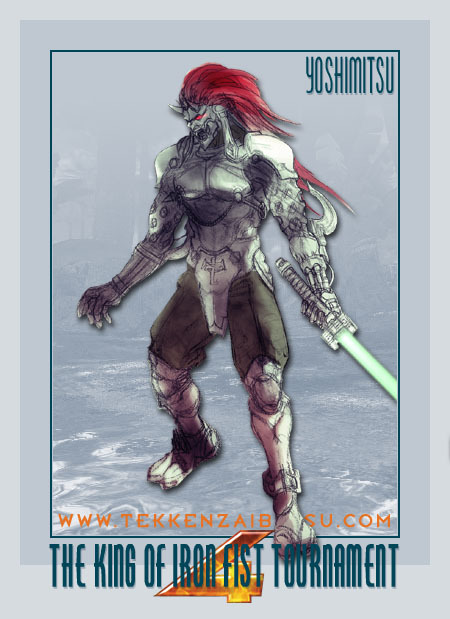 I always found it particularly interesting how his "latest" moveset directly evolved from TEKKEN into Soul Calibur, back into TEKKEN, and back again. 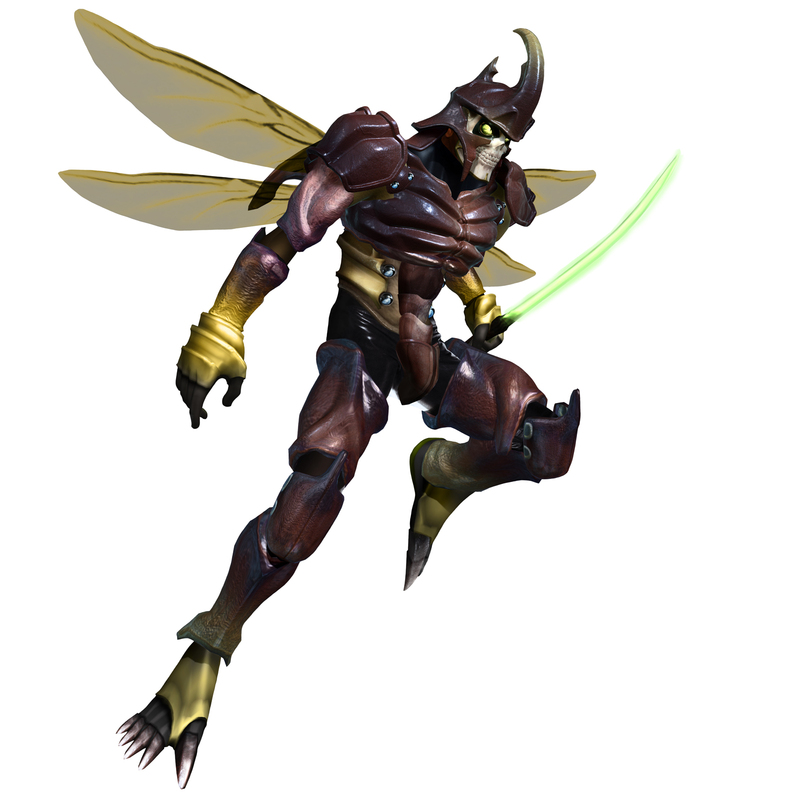 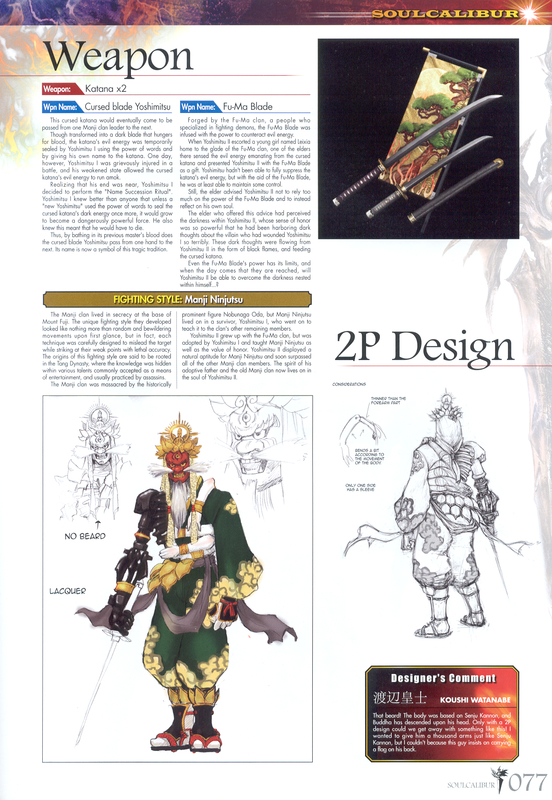 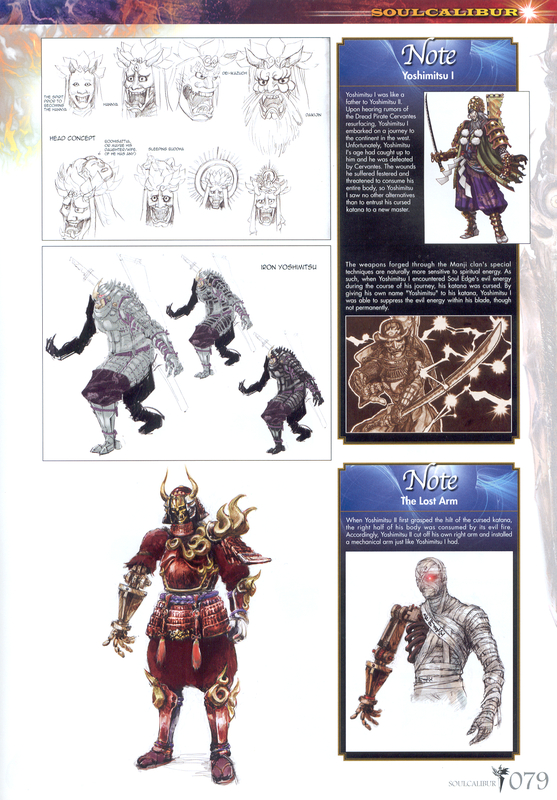 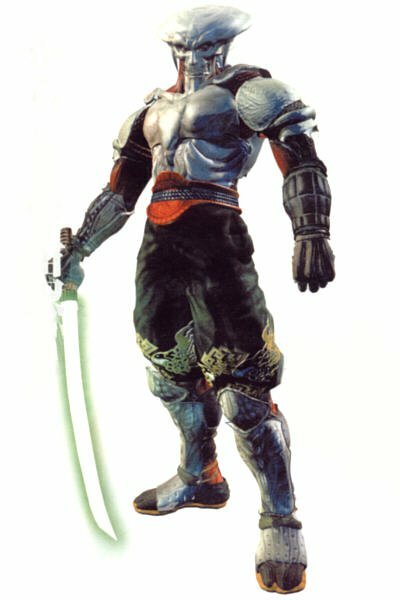 Yoshimitsu is a timeless design, and adds a certain uniqueness to every series he's appeared in. 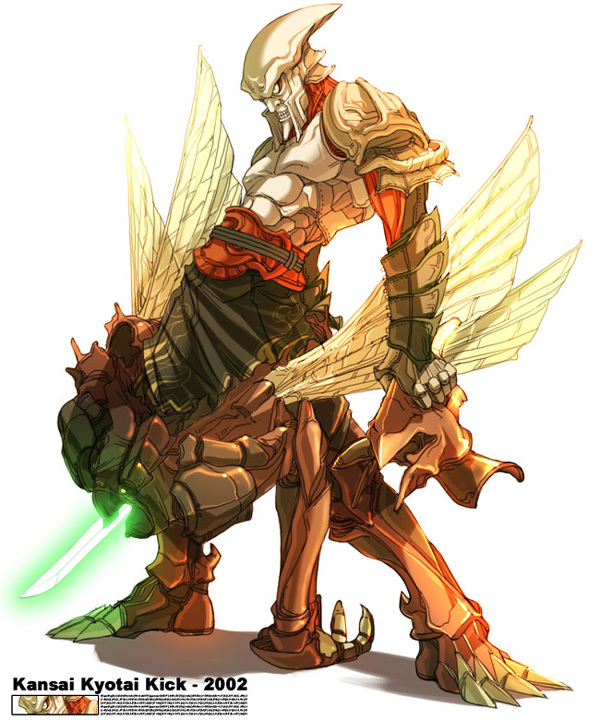 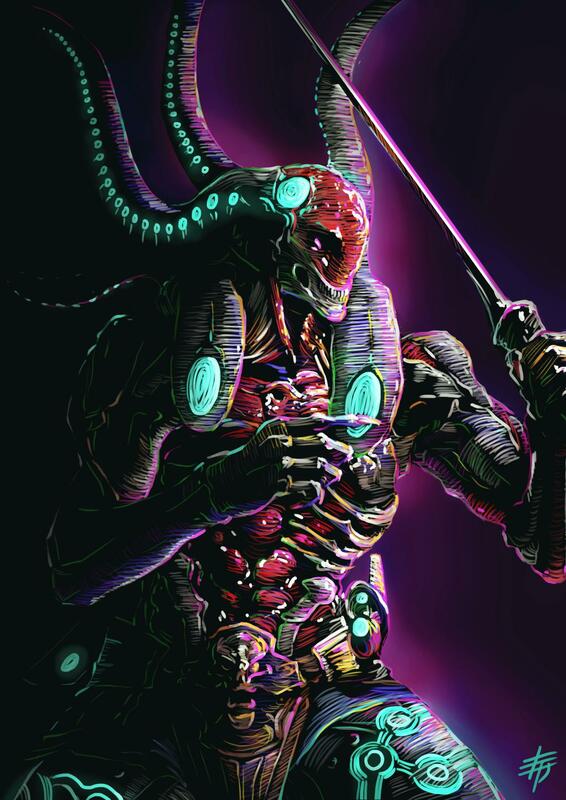 Click Here for more Yoshimitsu Artwork!